Lean is everywhere! The Homewood Suite where the tours participants are staying in Jacksonville has a huddle board! Sometimes, if you look for it - you will find Lean everywhere. Even before we left the hotel - while chatting to the reception clerk, I happens to glance around the corner and through an open office door. There it was! The Homewood Suites huddle board. One of the simplest, yet incredibly powerful Lean tools. A way to "work out loud". A way to engage the team. A way for everyone to be accountable. Nicely done Homewood! And speaking of engaging the teams! We had a lovely attendant named Ivy taking care of us this morning while we were getting breakfast. Ivy, a retired nurse, loves her work, and loves people. She would come around to all of the tables and personally welcome us, tell us not just her name, but also why she loves her job and all about her life, why she feels blessed to work with people every day, and all about her background. Being a retired nurse, she knows a lot about nutrition. 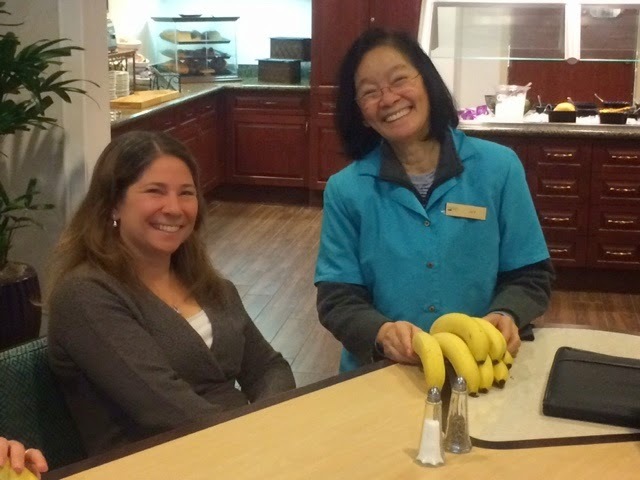 And she made a point of telling everyone they should be sure to have a banana before leaving for the day. She was sweet, compassionate, and engaged. And she certainly didn’t seem at all like a 66 year old. Maybe a 16 year old!!! The power of being positive!! After yesterday's incredible tours of vastly different scales of Lean implementation, the group is looking forward to seeing Lean in action again today. There is a sense that everyone is even more prepare and charged up with questions for our hosts today. And we were not disappointed. 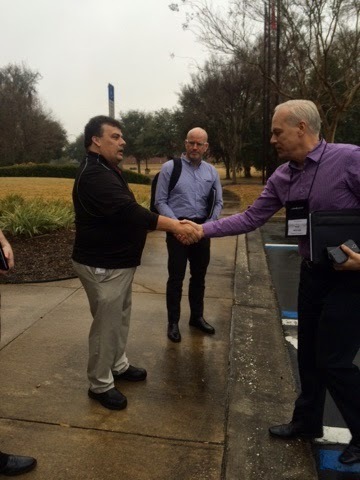 We were met by Brad Lyght, Director of Distribution. 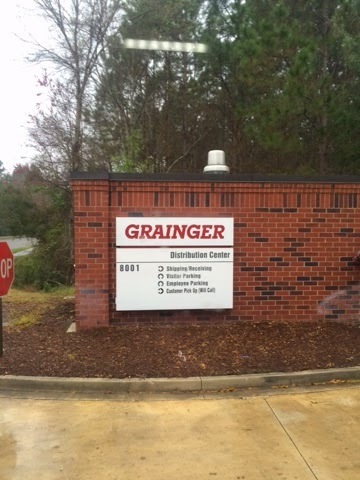 Grainger's Jacksonville (JAX-DC) is a large industrial supply distribution center employing approximately 140 people. They receive, stock and ship over 117,000 product SKU's. They process over 9,000 outbound line items a day. The tour started with Brad sharing some of Grainger's continuous improvement and corporate culture, as well as some samples of some Lean artifacts they use daily. We then went to the Gemba where we saw great examples of visual management. There were leader standard work boards that implemented visual controls to easily see when each leader had completed their daily leader standard work. Any team member can go to the board and review the comments and completion of any leader's work. This is a clear demonstration of modeling the behaviors that the leaders were looking for from their teams. As we toured the floor, from outbound shipping, to inbound receiving, to order picking, and on to packing - we could see where error proofing, elimination of waste, flow and safety design were part of every aspect of their operation. The visual management and safety cues were everywhere. One of the most critical roles in the warehouse operation is a role called “Flow Manager”. This person was responsible for distributing the incoming orders to the order pickers on the floor. 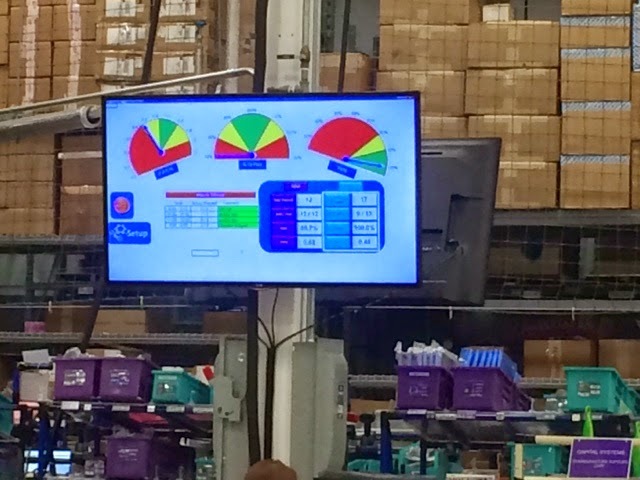 The Flow Manager was looking for leveling opportunities (Heijunka), and ensuring that each order picker had a logical flow through the warehouse so they weren’t doubling back on their route as they completed an order. While the operation and adoption of Lean philosophy and tools was amazing, Brad acknowledged during the wrap up that Grainger knew it had a long way to go. They knew there was much still to do. 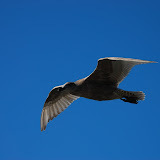 As he mentioned in the hallway “that’s just the nature of continuous improvement”. 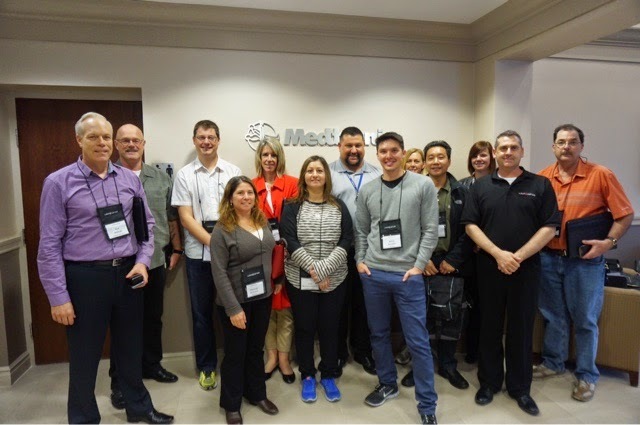 Medtronic has been on the journey of lean for the past 13 years. Here are some highlights: Lean is woven into the fabric of the company, each EE is involved into the continual improvement. Policy deployment and expectation is clearly defined throughout. Successes are celebrated and visually displayed throughout the facility. Daily communication regardless of value stream manager or floor technician consists of a huddle focused on identifying problems. Assembly lines and shipping areas are line balanced using heijunka and status of production is visual via computer monitors and andon lights. Cell based production is set up on kanban, line balanced and each step of production is visually displayed. Cells are also i-pad equipped which also come equipped with SOP's and the ability to track operator competence. Highly visual, very professional looking documents are present throughout. You can see that Medtronic takes great pride in their product and where they are at in their Lean journey.